Here’s a simple soup to help use up those ubiquitous spaghetti squash this time of year. Also what better use of the Thanksgiving turkey bones most of us will have later this week than to make some broth that can be used in this recipe? Start by partially cooking the spaghetti squash. I like to wash it, then pierce the skin all over with the tip of a paring knife. Place it in the microwave and cook it on high for 5 minutes. This softens the squash up just enough to make cutting it open lengthwise easier. Pull out all the seeds and rinse both halves out. Place in a small pan, cut side down. Add about 1/2″ water to the pan and bake at 400 degrees F for about 30 minutes, or until it is just soft enough to scrape the strands out with a fork. A good homemade base bone broth like from my rotisserie chicken soup will give the most depth of flavor, but if you don’t have time, doctoring up some good quality boxed broth will still yield tasty results. While the squash is baking, place the boxed broth, sliced ginger root, the mushroom stems and any green vegetables you happen to have on hand like celery and/or Chinese parsley (cilantro). Bring it all to a boil, then reduce the heat down to low and allow to simmer about 30 minutes or until you are ready to add the spaghetti squash strands. 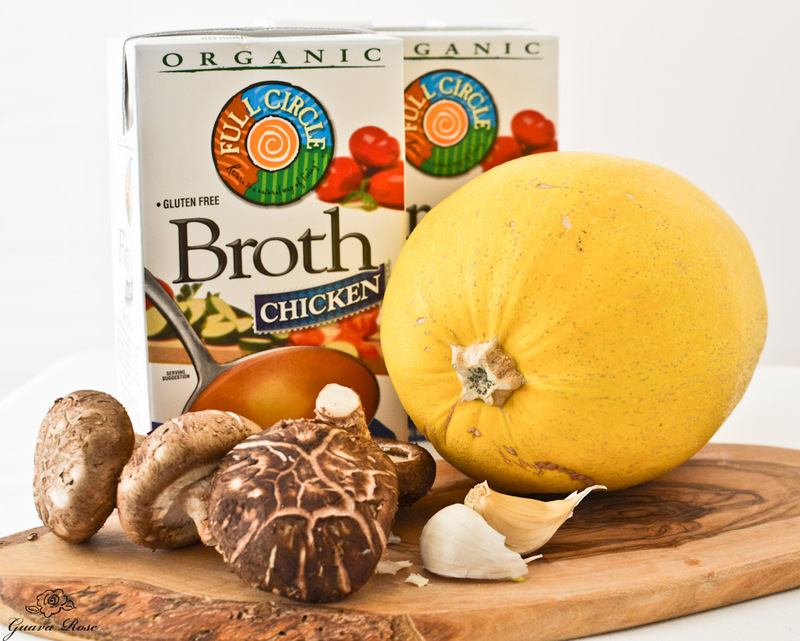 Strain out the vegetables, but add the ginger root slices back into the broth along with the spaghetti squash. Heat the oil in a frying pan on medium heat. Add the garlic and sliced mushrooms. Stir quickly to avoid letting the garlic get dark brown. Cook for 2 minutes, then add to the soup. Season with 3 T. soy sauce, 1 tsp. sesame oil, and several grinds of black pepper. Bring the pot back up to a boil, then turn the heat back down and et simmer on low for another 30-45 minutes until the squash is tender. I like the squash very tender, so I let it simmer closer to 45 minutes. Adjust seasoning by adding more soy sauce or salt to taste. For vegans, use vegetable broth and serve as is. For vegetarians, use vegetable broth and stir in some egg whites to make egg white ribbons. 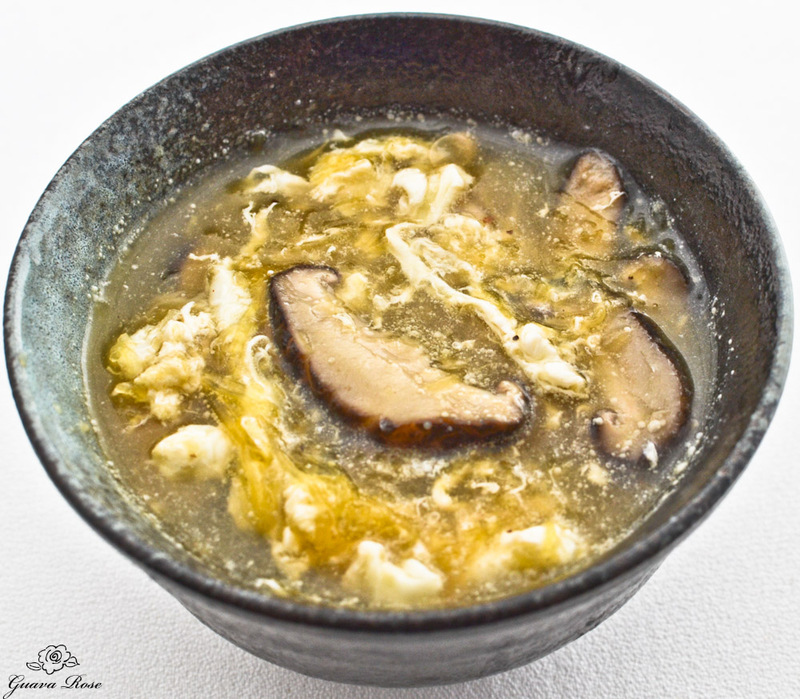 For meat free, use vegetable or chicken broth and stir in egg ribbons. For regular, use chicken broth, stir in egg ribbons, and add finely shredded chicken if desired. This soup really has the look and similar texture to shark fin soup. I haven’t had shark fin soup since I was a kid, but I still remember it. In recent years the terrible inhumane harvesting practices have been exposed, and now it’s become illegal. 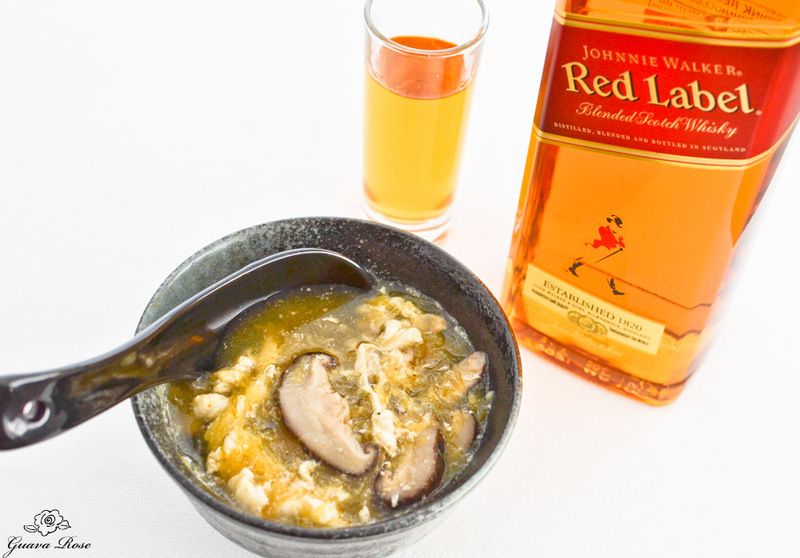 One thing this soup made me remember from long ago was being at Chinese banquets, where all the old people would pour jiggers of Johnny Walker whiskey into their soup and exclaim how good the soup was. It does make for an extra warming soup on a cold night! But I think I only need a splash, not a jiggerful. Have I become one of the old ones now? Wash squash. Pierce skin all over with the tip of a paring knife. Microwave on high for 5 minutes. Slice in half lengthwise. Clean out seeds and fibers and rinse. Place cut side down onto a baking tray. Add ½" of water to the tray. Bake at 400 degrees for 30 minutes. While squash is baking, pour broth into a large pot. 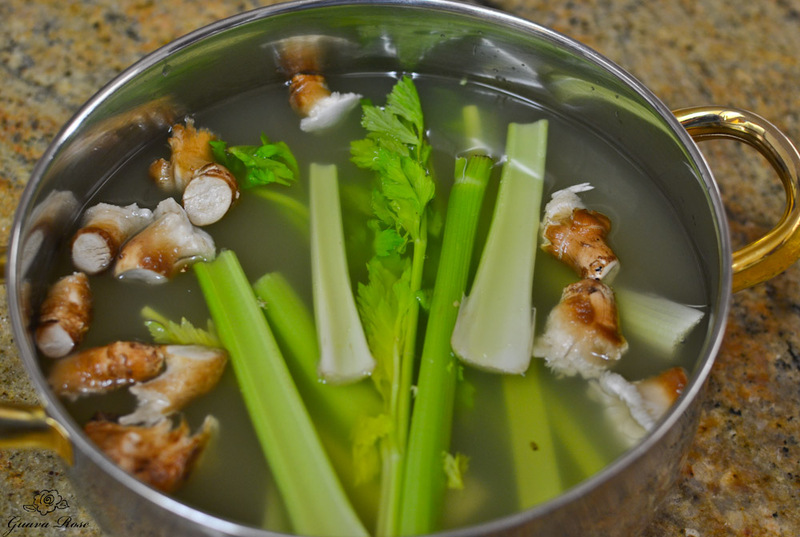 Tear off the mushroom stems and put them into the broth along with 3-4 stalks of celery, 2 slices of ginger root, and a handful of Chinese parsley if you have it. Turn heat on high and bring to a boil. Turn down to low and let simmer for 30 minutes or until squash is ready to be added. Before adding the squash, strain out the vegetables, but add the ginger root slices back into the broth. Pull hot spaghetti squash out of the oven and let cool a few minutes. Drain water from the pan, then carefully turn the halves over. Use a fork to scrape the partially cooked strands out. Place 4 cups of the squash strands into the simmering broth. If you have any remaining squash, save it for another use. Heat the olive oil in a frying pan on medium heat. Slice the mushroom caps and add them to the frying pan along with the garlic. Stir frequently and allow to cook 1-2 minutes. Do not let the garlic get dark brown. 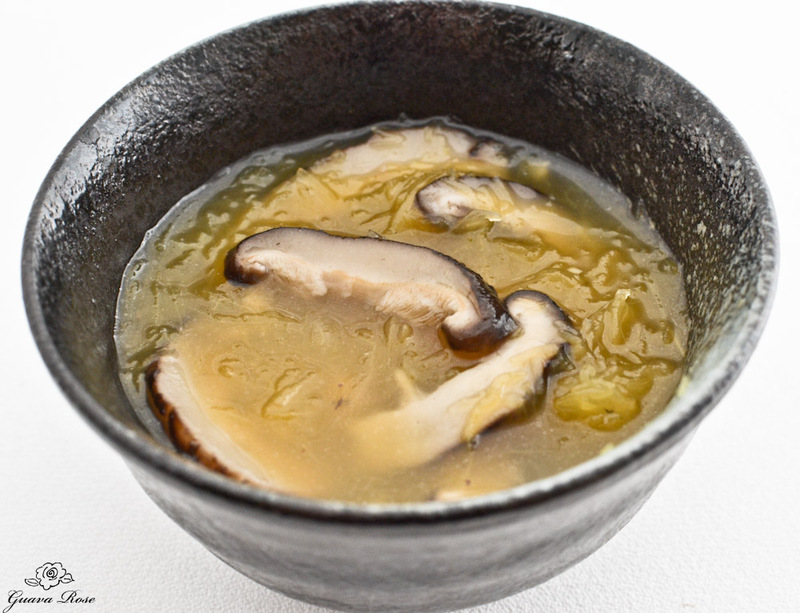 Add the sauteed mushrooms to the broth, along with the soy sauce, sesame oil, and several grinds of black pepper. Turn the heat up to high and bring the soup to a boil, then reduce heat to low and allow to simmer 30-45 minutes until the spaghetti squash is very tender. Right before serving, whisk the water into the egg whites and drizzle it into the soup while stirring the soup quickly in circles. The egg ribbons will instantly form.